The Allen house was built by a local businessman named Joe Lee Allen in 1906. He wanted the house to be the most impressive house in the whole town, which it certainly was at the time it was built, boasting impressive Queen Anne Victorian architecture and many other unusual features for the time such as multistory turrets and huge porch columns. Joe Allen died in 1917 but the house remained with the Allen family until 1986, though it was divided into apartments in 1956. In 2007 the current owners bought the house and it is now a private property, though it does hold private historic tours by appointment and also opens for a couple of days in October for Halloween tours. 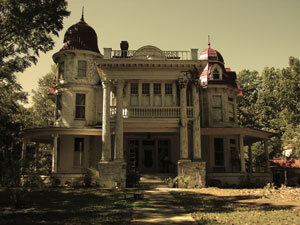 There is quite a well known urban legend surrounding the house which is told all over Arkansas. The legend is about the Allen's second daughter who was called Ladell. During the week leading up to 1949 she tried to commit suicide by drinking mercury and cyanide laced punch. Though it did not kill her immediately like she had hoped instead she suffered for a week until she passed away in the master suite of the home. Suicides always seem to induce ghost stories, but what happened next was simply very odd. Her mother sealed off the room and it wasn't opened for almost 40 years, not even once. This in itself has seemed to create a ghost story which has certainly been exaggerated, but there does seem to be a definite paranormal presence in the home. A ghost hunting team came to the property to investigate and on their first visit a large branch fell onto a power line and ripped the electrical meter off the house. Though on the second visit they recorded a number of EVP's and captured orbs in many photos. Ladell is thought to be the only ghost at the house and she likes to make presence known by making knocking sounds on the top floor and especially in the master suite were she died. Also the soft muffled sound of crying has been heard coming from the room when it's empty. The only other odd occurences around the house seem to be the house's hunger for swallowing objects. The current owners have commented on how the object likes to move things or just make them vanish all together. Whether something in the house has been hiding things in a place the owners have not yet found is still to be discovered.